With just under two months before the long awaited London 2012 Olympic Games begin, the media spotlight is certainly on Britain. Companies across the country are expecting the Olympic Games to have a positive effect on business with the influx of tourists creating a rare opportunity for an expansive global audience. Some companies in the UK simply want their marketing messages to support the Olympic Games as a matter of British pride, however other companies have less than honest intentions and want to trade off the ‘goodwill’ of the Olympic Games. This exists in the form of ambush marketing where one brand hopes to eclipse the marketing of an existing event sponsor through a publicity stunt to gain exposure, or where a brand attempts to simply ride on the coattails of the Olympic Games hoping the public will perceive an official association. The truth is that there are some important commercial barriers in place restricting marketing and advertising around the Olympics. Whether your intentions as a business are honest or not, any advertisement from a ‘non-authorised user’ that would lead a member of the public to presume an association to the Olympic Games will result in infringement of the London Olympic Association Right (LOAR) 2006. The London Organising Committee of the Olympic Games (LOCOG) has highlighted the statutory rights for marketing around the Olympics. Companies using the listed expressions in the course of trade, categorised below, will need to do so with care to avoid: removal of their merchandise, unlimited fines, or even a criminal conviction for flagrant abuse of the law. This legislation has been received both positively and negatively by brands and the public. Some argue that the law is extremely restrictive and the rights assumed by LOCOG are out of their remit. An example where this legislation has been regarded as particularly impractical occurred at the Ricoh Arena, home to Coventry Football Club. This stadium which is hosting football matches during the Olympics were informed that every non-official Olympic sponsor brand within the stadium, right down to the design of the hand-dryers must be covered up due to a conflict with existing sponsors. According to the facilities manager Antony Mundy, this has left them with a “mammoth task”. What LOCOG are trying to protect is ambush marketing and publicity stunts that seem to be common place at competitions such as the Olympic Games. They are right to do so; brands such as Nike have been guilty of ambush marketing with their pop-up ‘Nike Town’ which appeared on the doorstep of the Olympic Park during the Atlanta 1996 Olympic Games. In this instance the result was that 36% of the public believed that Nike, not Reebok were the official sponsors. The Olympics and the FIFA World Cup have been the prime targets for ambush marketing over recent years. As each competition comes to a close the law has become progressively more robust to prevent those seeking to associate themselves as official sponsors or partners. Some may argue that current measures in the light of ambush marketing are now too protective of the existing sponsors and that marketing around the Olympic Games is trying to negotiate around a minefield. This degree of protection was comically mocked during the 2010 FIFA World Cup in South Africa. 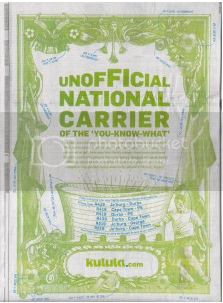 South African budget airline Kulula decided on the marketing slogan ‘The Unofficial Carrier of the You-know What’ in the lead-up of the World Cup. Ironically this still became censored by the FIFA committee. Does the legislation strike the right balance? Coming from a professional sponsorship agency, we are well aware of the level of sponsorship that goes into the Olympic Games and the strategy behind the investment from brands. In tough economic times companies are investing large sums of money into the Olympic Games. Brand exposure and exclusivity in your industry is undoubtedly the primary reasons behind sponsorship. To a certain degree it could also be argued that in the spirit of competition, one-upmanship in being the headline sponsor between global brands such Nike and Adidas is just as fierce as the competing that will be seen in the Olympic Park this summer. What we need to remember however is that, money raised from sponsorship amounts to nearly half of the capital required to stage the Olympic Games in the first place. If these brands don’t feel that their investment has been appropriately protected, then the level of support into the Olympic Games is severely jeopardised for future competitions. We all want the London Olympic Games to run at the best of its ability, for the sake of both the public and the athletes. Furthermore, despite arguments that too much power is afforded to LOCOG, and the level of protection given to official sponsors, London 2012 will undoubtedly undergo some degree of ambush marketing this summer. Whether you agree with the legislation surrounding the Olympic Games or not, it is important to not get caught out unawares of the restrictions in place. So if in doubt check the legislation.